This article is about the species from Final Fantasy. For the game series starring the character Chocobo, see List of Chocobo media. The Chocobo (Japanese: チョコボ, Hepburn: Chokobo) is a fictional species from the Final Fantasy video game series made by Square and Square Enix (since 1988). The creature is generally a flightless bird, though certain highly specialized breeds in some titles retain the ability to fly. It bears a resemblance to casuariiformes and ratites, capable of being ridden and otherwise used by player characters during gameplay. Chocobos first appeared in Final Fantasy II and have been featured in almost all subsequent Final Fantasy games, as well as making cameo appearances in numerous other games. A spin-off Chocobo series featuring chocobos has also been created. The chocobo was created and designed by Koichi Ishii, a video game director who worked on various Final Fantasy titles. The chocobo appears remarkably similar to and was likely inspired by the prehistoric bird Gastornis. Hiromichi Tanaka has speculated that the chocobo concept may have come from Kyorochan, a character in television advertisements for Morinaga & Company's chocolate candy, which is also a bird with the call of "kweh". Morinaga has also released a tie-in product, Chocobo no Chocoball (チョコボのチョコボール, lit. "Chocobo's Chocoball"). Another likely inspiration was Hayao Miyazaki's Horseclaws, which appear in the manga Nausicaä of the Valley of the Wind and the anime film of the same name, which Final Fantasy creator Hironobu Sakaguchi once cited as an influence on his series. In turn, Miyazaki's Horseclaws were inspired by the extinct Gastornis species. This mythical creature is a "cousin" of the ostrich and is designed to have yellow feathers, but there are rare Chocobo breeds that are capable of giving birth to different-colored chicks. The Chocobos are known for being intelligent and friendly, assisting heroes and other characters on their journeys by allowing themselves to be ridden like horses. It also on occasion demonstrates an ability to communicate with other sentient creatures. They have on occasion been used for war as well, and can be ferocious in combat. 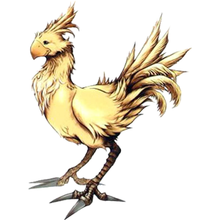 While most chocobos that appear in the games are yellow, certain rare breeds are of different colors and have special abilities, including being able to fly or use magic. Chocobos are also occasionally used as lightly armored war mounts, assisting their riders in battle with their beak and claws. A variant is the Fat Chocobo (or Chubby Chocobo) character; an extremely obese yellow or white chocobo that can eat the player's items for storage. The onomatopoeia for a chocobo's call is "kweh" (クエ, kue) (sometimes replaced with "wark" in English translations or more recently pronounced as "kway"). Most chocobos dwell in forests (although those from Final Fantasy VII live in grasslands and snowfields). While timid in the wild and vicious if threatened, they tame rather easily and act as vehicles, as well as quick and effective cavalry. In this role they tend to be capable of crossing shallow water and are noted for their high speeds. Most often they can be caught in the wild and ridden without fear of random encounters, escaping after the player dismounts. A common food for chocobos, usually used to help tame the bird, are Gysahl Greens, named after a town in Final Fantasy III. Final Fantasy II was the first installment to have chocobos play a role in the plot. Boko (sometimes translated as Boco) went on to become a recurring chocobo name in later installments. In Final Fantasy IV, the party also encounters a black species of chocobo which is capable of flight. In Final Fantasy XIII, the character Sazh Katzroy has a baby chocobo for a pet. Within Final Fantasy XI, the raising and breeding of chocobos was a long-requested activity, and was enabled in the Summer 2006 update. Chocobo racing began in March 2007. Players were allowed to race player-raised chocobos against non-player characters. Winning racers earn "Chocobucks", which can be used to buy items that assist chocobo breeding. Chocobos have appeared in all numbered installments except the first, in addition to the Final Fantasy Tactics series. Chocobos appear as a summon in Final Fantasy III, IV, V, VII, and VIII. Fat Chocobo appears in Final Fantasy III, IV, V, VII, VIII, and IX. The chocobo Boko appears in Final Fantasy V and VIII, and Final Fantasy Tactics. Black Chocobos, which sometimes possess the ability to fly, are found in Final Fantasy IV, V, VII, XI, and XII, Final Fantasy Tactics, Final Fantasy Tactics A2, and Final Fantasy Fables: Chocobo's Dungeon. Final Fantasy Mystic Quest features several chocobo-shaped weather vanes in the town of Windia. In Final Fantasy Crystal Chronicles one can obtain the Chocobo Shield and the Chocobo Pocket items, and are included in Final Fantasy Crystal Chronicles: The Crystal Bearers. In the animated sequel to Final Fantasy V, Final Fantasy: Legend of the Crystals, one of the main characters can summon pink, featherless chocobos. In addition, Final Fantasy Adventure featured a chocobo egg which hatched to aid the player. Chocobos are common in the anime series Final Fantasy: Unlimited, and one named Chobi joins the cast in their adventure. Final Fantasy: The Spirits Within and Final Fantasy VII: Advent Children both have chocobo-related easter eggs. The Chocobo series is a spin-off series of games first developed by Square Co., and later by Square Enix, featuring a chibi version of the Final Fantasy series mascot, the Chocobo, as the protagonist. These games include Mystery Dungeon installments and a variety of minigame collections, over a wide variety of video game consoles. Chocobos appear frequently in other Square and Square Enix games, notably in the Mana series. A chocobo serves as a mount in Seiken Densetsu (Final Fantasy Adventure), and is later changed into a 'Chocobot'. It was removed from the 2003 remake Sword of Mana in favor of the 'Cannon Ball Travel' which originated in Secret of Mana; however, a chocobo can be seen in Sword of Mana by waiting for a certain period of time after the completion of the game. Wild black chocobos appear as monsters in Legend of Mana, while tame yellow chocobos can be hatched by the player from eggs to assist in battle. In Secret of Evermore, a Chocobo Egg is a rare item. In Kingdom Hearts, there is a Keyblade/keychain ("Metal Chocobo") and a Gummi Ship design that are both named and modeled after a chocobo; there is also a drawing of a chocobo in the cave on the Destiny Islands. In Parasite Eve, a banner depicting a chocobo hangs over the entrance to the American Museum of Natural History, while a chocobo skeleton can be found nearby. In Tobal 2, a chocobo is obtainable as a combatant. Web-based minigames starring chocobos are also featured on Square Enix's member site. An undead creature appears in The Battle for Wesnoth, described as "ostrich-like large birds once used as mounts by a lost civilization". A Minecraft mod exists called "ChocoCraft" which adds various breeds of chocobo's and various breeding mechanisms, and is a part of several adventure/exploration-oriented modpacks, like Hexxit. A Stardew Valley texture mod exists which replaces the horse sprite with a Chocobo. It was made by Chucklefish user Kitsutsune. In Super Smash Bros. for Nintendo 3DS and Wii U it appears as a costume for the Mii fighters. Assassin's Creed: Origins features a "kweh" mount which is a camel outfitted to look like a Chocobo. The chocobo signature theme is an upbeat ditty that is present in one form or another in all Final Fantasy games since their introduction in Final Fantasy II, frequently as variants or remixes: for instance, the Final Fantasy VII chocobo races have a frantic version, while the futuristic Final Fantasy VIII has a more modern one. These songs are titled with the suffix "de Chocobo" and prefixed by the name of the style in which they are played. For example, "Techno de Chocobo" from Final Fantasy VI features a dance remix inspired by Yellow Magic Orchestra's "Technopolis", while "Cinco de Chocobo" from Final Fantasy VII features a jazz remix (in 5/4 time, cinco being Spanish and Portuguese for the number five). A newer version of the theme, titled "Swing de Chocobo", was created by Nobuo Uematsu for the concerts VOICES and Play!. It has been performed by a number of different orchestras between 2005 and today. Music composed for chocobo appearances in the Final Fantasy games was used in the Distant Worlds: Music from Final Fantasy concert tour. Chocobos are found in the anime series Dog Days as the main form of transportation in the fantasy world of Flonyard. These giant birds are called chocobos in the series though there appears to be no relation to the chocobos in Final Fantasy or Square Enix. Chocobo merchandise has been released, including a rubber duck, a plush baby Chocobo, and coffee mugs. Square Enix designed a chocobo character costume for the release of Chocobo Tales. In 2008, Boko the Chocobo from Final Fantasy V was voted by Joystiq as the 20th most desired character to be placed in the Final Fantasy fighting game Dissidia: Final Fantasy. In 2007, the Chocobo was listed by IGN as one of the most likely Square Enix characters that could appear in the Super Smash Bros. series, comparing them to the Slime from Dragon Quest and saying that "the Chocobo could be an excellent enemy for Yoshi". That same year, UGO.com ranked them at number seven on the list of the best video game companions. ^ a b Riley, Adam (February 8, 2007). "Cubed3 Interview with Hiromichi Tanaka". Cubed3. Archived from the original on March 28, 2013. Retrieved April 7, 2013. ^ Rogers, Tim (March 27, 2006). "In Defense of Final Fantasy XII". Edge. Archived from the original on October 9, 2014. Okay, so the Chocobos -- big, yellow riding birds -- were actually stolen from Hayao Miyazaki's movie Nausicaa and the Valley of the Wind, and Hironobu Sakaguchi freely admitted that way back when. ^ "Time, Places & Characters // Nausicaä Manga // Nausicaa.net". Archived from the original on 2012-06-16. ^ V-Jump Magazine (in Japanese). January 2009. p. 24. ^ Perry, Douglass C. (2006-06-01). "It's Chocobo Breeding Time". IGN. Archived from the original on June 15, 2006. Retrieved 2006-08-15. ^ Cordeira, Jim (2007-03-27). "Final Fantasy XI: Chocobo Racing to launch this week". Gaming Age. Archived from the original on 2008-02-04. Retrieved 2008-02-24. ^ Hill, Doug (2001). "Interview with Final Fantasy Producer, Hironobu Sakaguchi". RPGamer. Archived from the original on 2008-12-01. Retrieved 2009-01-16. ^ "Master Chocobo - Dota 2 Wiki". dota2.gamepedia.com. Archived from the original on 2017-04-11. Retrieved 2017-04-10. ^ "Tobal 2: Another Smooth Move from Square". Electronic Gaming Monthly. No. 96. Ziff Davis. July 1997. p. 104. ^ Chris Kohler (March 18, 2008). "'SQUARE ENIX MEMBERS' COMING TO AMERICA". Wired.com. Archived from the original on April 29, 2018. ^ "Chocobone". Archived from the original on 2014-07-14. ^ "ChocoCraft". Curse. Archived from the original on 2016-03-25. ^ "RELEASED - Ride-able Chocobo (FF14 style!) Lavender, coral pink, ect. added! - Chucklefish Forums". Archived from the original on 2016-04-08. ^ "Assassin's Creed: Origins Players Get A Chocobo-like Camel". siliconera.com. Archived from the original on 2018-01-13. ^ Brian Davis (2008-03-01). "Distant Worlds: Music from Final Fantasy, Chicago". Music4Games. Archived from the original on 2008-03-31. Retrieved 2008-04-01. ^ "Dog Days". student. Seven Arcs. Archived from the original on 27 August 2011. Retrieved 28 July 2011. ^ Michael McWhertor (2008-01-22). "Final Fantasy's Chocobo Goes Rubbery, Ducky". Kotaku. Archived from the original on January 23, 2008. Retrieved 2008-04-01. ^ "PlayStation: The Official Magazine Holiday Gift Guide '08," PlayStation: The Official Magazine 13 (Holiday 2008): 37. ^ McWhertor, Michael (2007-05-16). "Chocobo Coffee Mugs". Kotaku. Archived from the original on April 26, 2009. Retrieved 2009-02-17. ^ Fahey, Mike (2006-12-14). "Chocobos In The Wild". Kotaku. Archived from the original on October 12, 2012. Retrieved 2009-02-18. ^ Majed Athab (2008-03-28). "Top 20 Final Fantasy characters that should be in Dissidia". Archived from the original on 2012-10-18. Retrieved 2008-03-31. ^ Lucas M. Thomas (2007-11-09). "Smash It Up! - It's Hip to be Square". IGN. Retrieved 2011-04-06.